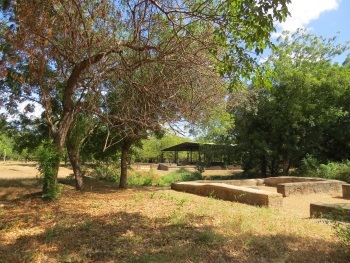 The Ruins of León Viejo comprise an archaeological site that holds one of the oldest Spanish colonial settlements in the Americas (1524). It has been uniquely preserved because it didn't develop further: the town was finally abandoned after an earthquake in 1610. The ruins of this former provincial capital were re-discovered in 1967. They have become a valuable source of information about life in the early stages of the Spanish colonial period. As a result of excavations, it's known that the city had a similar sketch to almost all cities of Latin America in that time, in form of an exact square and a plaza located in its center. Notable buildings included the Cathedral, a Convent, the Royal Foundry and several private houses. León Viejo is said to be one of the earliest cities of Spanish America. Panama Viejo, that I visited last week, makes the same claim. I have been looking for a list in which order these Spanish overseas cities were founded, but could only find this one. It doesn't even include León Viejo; if I fit it in, with 1524 it would come on a shared 11th place among the Spanish colonial cities. The difference between this and many other cities on that list is that it has not developed since the 16th century, when it was abandoned. Anyway, León Viejo was of great importance to Nicaragua as it was its first colonial capital. The Spanish settled on the shore of what then was called the Lake of Leon. In its heyday, some 200 Spanish families lived here. A serious town was constructed for them, although there weren't many inhabitants: everything seems to have been supersized. There were no less than three convents, and the town hall spanned a full block. In the surrounding area lived thousands of native Americans, who were dominated and put to work by the Spanish. The entrance fee to what is now an archaelogical site comes with a guide. I was the first visitor of the day, and the only person on site during my visit. We started at the two exhibition rooms near the entrance. One is about the Spanish town, the other focuses on the indigenous culture. The point is made that early Nicaraguans already were in contact with the Ancient Peruvians, as Peruvian pottery was found at this site. Another reminder of the plight of the indigenous people is the statue of an Indian attacked by dogs that now adorns the center of the plaza. Some 16 ruined buildings have been partially restored. Or maybe we should say "partially uncovered, and then put under protected cover again". Actually only the La Merced Convent has a recognizable shape. The road is also restored. I was actually more amazed by the trees, the fruits, the squirrels and the view of Momotombo Volcano than by the ruins. The site looks well-maintained, maybe surprisingly so for a poor country that Nicaragua is (the 2nd or 3rd poorest in the western hemisphere after Haïti and possibly Honduras). This is also a pleasant change after seeing the difficulties that Panama has with conservation. I reached León Viejo by public transport from León. That's a fun thing to do if you have time. You can get there by local buses, with a change in the town of La Paz Centro. The bus driver will know where "Las Ruinas" are, you have to walk 200m from the final stop in the town of Puerto Momotombo. The site is also signposted all over town, it's impossible to miss. I had to wait almost an hour for the return bus, and spent that sitting in the main street watching rural Nicaraguan life go by. Horsecarts are still a common mode of transport here. I also noticed a few wandering salesmen, going from door to door selling plastic stuff or fruits. León Viejo is not a spectacular sight, and I gave it only a 6.5 out of 10. But it is surely worth a detour when you're visiting northern Nicaragua. Although they may not see that many visitors, the archaelogical site and attached museum are kept in a good state. yeah, my name is stephanie. and, my parents are both from nicaragua but, we live in the u.s so, this summer of 2009 i went to the ruins of viejo leon . it was a great experiance to know what it was like. also, sad to know that some indians were drag to death on a little trail they have that you can see when you take the tour like i did . well you also see cool monuments and old constuctions that are still standing . also a beautiful view at the end of the tour . Leon Viejo consists of the remains of a colonial town founded in 1524 which had largely declined by 1580 before being finally abandoned in 1609. It then became covered by volcanic ash and was “lost” until 1967 and excavations took place. Around 18 structures have been identified, together with a plaza and main street - reflecting just how small the intial colonial settlements and populations were. The remains are set in a wooded/grassed site in sight of the town’s ultimate nemesis – the volcano of Momotombo (photo). They consist of a series of low walls rarely rising above a metre or so high which are capped by modern cement to preserve them (together in some cases with more substantial steel framed structures). The buildings include a cathedral, a convent, a fort, houses of the governor and several merchants and a number of structures of unknown purposes. There are no paintings, carvings, pillars or statues as in many classical “Old World” archaeological sites – just the rough layouts of the exterior walls/rooms and, in the religious buildings, a few graves. At first sight there is not a lot to see! Yet we found the place well worth the 12+ km detour off the Carretera Nueva from Managua to (New) Leon to the very rural village of Momotombo on the banks of Lake Managua (It could well be an “all day” job to get to and from by public transport from Managua or Leon). The site is surprisingly well set out and each structure has a sign with an informative description in Spanish and English, together with a site plan showing its location. The requirement, mentioned by the previous reviewer and in the guide books to have a (Spanish speaking) guide, was not enforced when we were there in Dec 2005. We did however tag along for part of the visit with another small group who did have a guide and we had the Footprint Guide to Nicaragua which has almost 2 pages on the site. The book, the signs and the guide (in that sequence), together with one’s own imagination, help bring to life what could otherwise be a rather dull site. Whilst there are many extant American “Colonial Cities” on the UNESCO list (see the “Themes” section on this site) in my view none of them preserves the essence of those very earliest days of the European conquest and most are now bustling towns full of “accretions” from the 18/19 and 20th centuries. At Leon Viejo you can sense the newness and remoteness of the frontier. We enjoyed Panama’s Portobelo for much the same reason. The description on 1 house states that Hernando de Soto lived there as a “Corregidor” (Magistrate). At the time he had yet to join Pizzaro on the expedition to Peru and the execution of Atahuallpa in 1533. At the Cathedral in 1532 (?) the “Apostle of the Indians” Bartholome de las Casas preached against further conquest of the Indians and was run out of town! This was all VERY early in the Iberian conquest of the continent. The town’s brief history fully reflects the brutality and treachery of the Conquest. The original founder Cordoba was beheaded by the first governor Davila – who, ironically, was later buried next to him until both bodies were removed some 475 years later during the excavations (their remains still share a modern memorial on the site)! Nicaragua’s population is significantly mestizo even if it doesn’t have the indigenous cultural reputation of eg Guatemala. A modern statue on the site of an Indian being attacked by a dog recalls one particularly brutal early event which occurred at Leon Viejo when the governor murdered 12 Indian hostages in 1528 using his killer dogs as the executioners. At other locations in Nicaragua you will also see things which reflect the sense of hurt and pride in the “indigeno” background shared in varying degrees by some 96% of the population. To miss Leon Viejo would be to miss a significant piece of the jig saw which makes up the “whole” picture of this touristically undervalued country. I visited the ruins in July 2003. The site can be covered with a (mandatory guide, Spanish only) in about 45 minutes. It is located on the outskirts of the small town of Mamotambo, a 20 minute bus ride from La Paz Centro, which is accessible by frequent buses from Leon or Managua Ask to be let off at Las Ruinas and from there it's a ten minute walk down a dusty road to the ruins. Few facilities in the town or at the site. There had been fewer than ten visitors in the past three days according to the guest register. It is a very hot and humid location so bring water but it is well maintained. Especially interesting are the cathedral, a massive stone structure, given the overall size of the settlement and the governor's house, the layout of which is still the norm in nearby Leon. Plaster casts of the founders, one of whom killed the under, lie together under the cathedral vault. Monuments to the Spanish rulers and Indians who rose in revolt against them attest to the brutal, bloody history of the settlement. A final must is the climb to the top of the old fort for a stunning view of the nearby volcanoes and the lake. Take a bus from Leon or Managua to the bus station of La Paz Centro, and change to the local bus to Puerto Momotombo. It stops within a few hundred metres from "Las Ruinas". The journey takes about 1 dollar & 2 hours each way from Leon. Dog statues: The site contains a statue of a dog biting the leg of an indigenous man in memory of one particularly brutal early event there when the governor murdered 12 Indian hostages in 1528 using his killer dogs as the executioners. Archaeological potential: "Moreover, the site has immense archaeological potential"
Foreigner prices: "admission is C$12 for Nicaraguan residents and US$2 for foreigners (c60C$)" BUT the US$2 includes a guided tour!! !